“Understand what this project is: It is providing the ability of Canada to pump their oil, send it through our land down to the Gulf where it will be sold everywhere else,” the president said yesterday during a visit to Yangon, Myanmar. “It doesn’t have an impact on U.S. gas prices.” . . . The federal government has significantly expanded undercover operations in recent years, with officers from at least 40 agencies posing as business people, welfare recipients, political protesters and even doctors or ministers to ferret out wrongdoing, records and interviews show. . . . .
At the Internal Revenue Service, dozens of undercover agents chase suspected tax evaders worldwide, by posing as tax preparers or accountants or drug dealers or yacht buyers, court records show. . . .
“Done right, undercover work can be a very effective law enforcement method, but it carries serious risks and should only be undertaken with proper training, supervision and oversight,” said Michael German, a former F.B.I. undercover agent who is a fellow at New York University’s law school. “Ultimately it is government deceitfulness and participation in criminal activity, which is only justifiable when it is used to resolve the most serious crimes.” . . . But many operations are not linked to terrorism. . . . Remember when it was concerning that Joe Salazar’s representative basically gave her blessing for an undercover James O’Keefe and his friends to commit voter fraud? This is why. Today, our sources tell us that allegedly a Denver Police Officer ballot with a signature cure turned up in Adams County. The only problem? The officer is saying he did not vote. Our source up north is further saying that many showing up on the cured list have moved away. . . .
With Gabrielle Giffords' gun control organization spending at least $1.5 million and launching what even the liberal Arizona Republic labeled as “base and vile" ads, Republican Martha McSally appears to have run the congressional race by 161 votes. There will be a recount, but the vote counters don't think that the result will be changed.
. . . McCauley says, and has sworn in an affidavit in federal court for the unsuccessful suit seeking to invalidate the law, that he was told by the administration not to answer questions from lawmakers about the law's effectiveness in curbing gun crime or stopping mass shootings. According to his affidavit from this spring's court case, the retired trooper was asked during a State House Judiciary subcommittee hearing, where he was called to testify, if the ban would have an effect on crime in Maryland. "As I began to respond, I was commanded by Shanetta Paskel, the Deputy Legislative Officer for the Office of Governor Martin O'Malley, not to answer the delegate's question," McCauley said in court papers. The trooper said he acquiesced to her request because he believed she was his superior in the administration. But, had he been able to answer, he said he would have told the delegate that the banned firearms are almost never used in crimes in the state -- less than 5 percent involve them -- and that it would have no effect on mass shootings since stricter mental health protections were more important. . . . Question: Did Chinese agree to global warming agreement because it doesn't change anything or because they know that with Republicans controlling the Senate no treaty will be approved? The promise of 20% of energy from non fossil fuels actually requires a slower growth rate for those sources than has been true up until now. 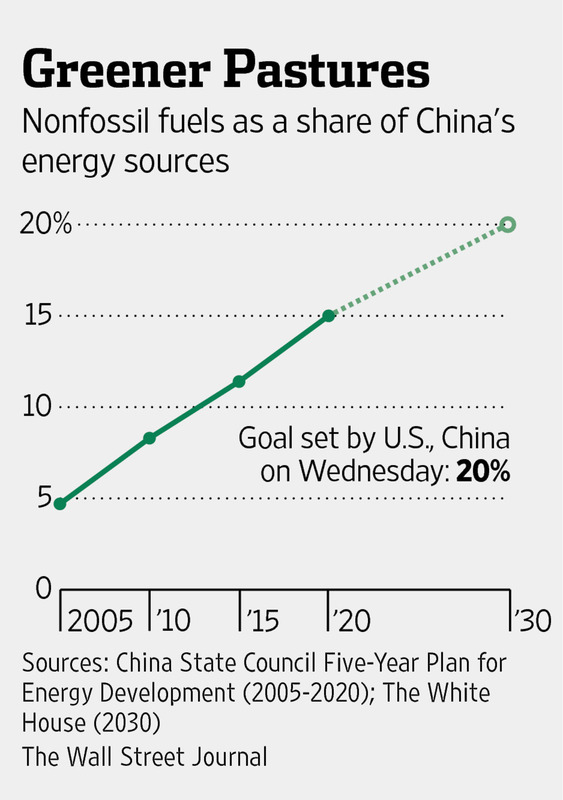 Meanwhile, the US has agreed to a dramatically greater reduction in carbon emissions. As part of its plan, the U.S. said Wednesday it would double the average pace of its carbon-dioxide reductions after 2020, eyeing an overall reduction of greenhouse-gas emissions of between 26% and 28% by 2025, compared with 2005 levels. . . . But the agreement requires that the Senate pass the UN Treaty. It seems extremely convenient for China to make this agreement immediately after Republicans take control of the Senate. It is unlikely that an agreement would have been ratified with the Democrats in control, but with the Republicans there, it will allow Obama to attack them when the treaty is defeated. Hillary Clinton is meeting right now with David Plouffe trying to “define a rationale for her candidacy.” After decades in public life she apparently still needs a strategist to tell her what she is all about. . . .
Missouri State Senator Jamilah Nasheed had a gun in her possession at the time she was arrested Monday night outside the Ferguson Police Department, according to Ferguson Police Chief Tom Jackson. Nasheed declined comment about the having the weapon, but did tell News 4 she has a concealed carry permit. A Ferguson police officer said Nasheed was carrying a fully-loaded 9mm handgun and additional rounds of ammunition. . . .
Nasheed was formally charged with Failure to Obey Lawful Order of Police and Manner of Walking in the Roadway. She was released from St. Ann jail before 11:00 a.m. Tuesday morning. . . .
Marcos Portnoi and Chien-Chung Shen at the University of Delaware have a new paper entitled: "Wireless-Delimited Secure Zones with Encrypted Attribute-Based Broadcast for Safe Firearms"
This work presents an application of the highly expressive Attribute-Based Encryption to implement wireless- delimited Secure Zones for firearms. Within these zones, radio- transmitted local policies based on attributes of the consumer and the firearm are received by embedded hardware in the firearms, which then advises the consumer about safe operations. The Secure Zones utilize Attribute-Based Encryption to encode the policies and consumer or user attributes, and providing privacy and security through it cryptography. We describe a holistic approach to evolving the firearm to a cyber-physical system to aid in augmenting safety. We introduce a conceptual model for a firearm equipped with sensors and a context-aware software agent. Based on the information from the sensors, the agent can access the context and inform the consumer of potential unsafe operations. 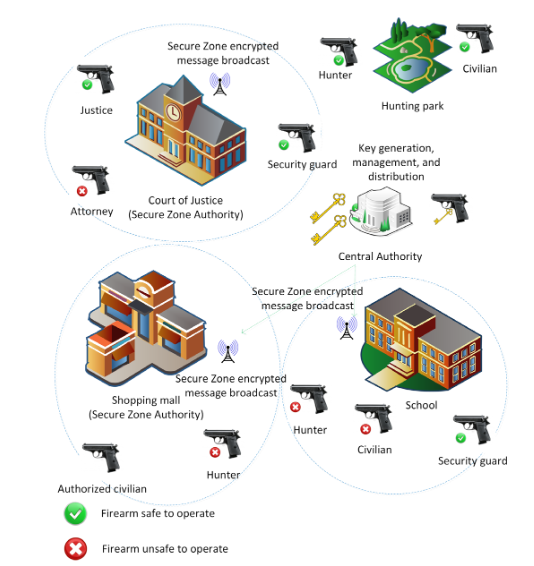 To support Secure Zones and the cyber-physical firearm model, we propose a Key Infrastructure Scheme for key generation, distribution, and management, and a Context-Aware Software Agent Framework for Firearms. The notion is that instead of controlling gun sales, WiFi signals could be used to turn guns off in certain areas. But does anyone think that criminals can't get around this? Either by using a traditional gun or disabling the electronic safety on their gun. In addition, if criminals get ahold of these Wifi signals that disable gun, it might allow them to disarm their victims before the criminals attack them. Jonathan Gruber: This bill was written in a tortured way to make sure that CBO did not score the mandate as taxes. Score the mandate as taxes and the bill dies. OK, so it was written to do that. . . . Lack of transparency is a huge political advantage. Call it the stupidity of the American voter or whatever. But basically that was really, really critical to getting the thing to pass. And you know it is a second best argument. Look, I wish Mark was right we could make it all transparent, but I would rather have this law than not. . . . Certainly there is voter ignorance, but Gruber's admission that they purposely hid information from voters is maddening. Sometime voters are wrong, though Gruber seems to think that is the common state of things, but in this case I believe that voters were smarter than this economist. But the open lying about what was in the bill is amazing. For more on Jonathan Gruber see these posts. UPDATE: Jon Gruber now says that he just misspoke when he made the above comments. "The comments in the video were made at an academic conference," Gruber said on "Ronan Farrow Daily." "I was speaking off the cuff. I basically spoke inappropriately. I regret having made those comments." . . .
On Tuesday, Gruber said he only meant that much of ObamaCare's financing was done through the tax code, calling that more "politically palatable" than other means. "That was the only point I was making," he said. . . . .
People can watch the above video themselves and judge whether Gruber simply wasn't speaking clearly. A suicide bomber on Monday blew himself up during a school assembly in northeastern Nigeria, killing at least 47 people and showing how an Islamist insurgency is apparently drawing young, radical and educated people to its ranks. The explosion took place shortly after a morning assembly began at the Government Senior Science Secondary School in Potiskum in Nigeria’s northeastern Yobe state, said Nigeria Police Spokesman Emmanuel Ojukwu. He reported 79 injured, in addition to 47 dead. . . . Lately, Dan McMullen has been bringing an extra gun to his office in Ferguson, Missouri. McMullen runs Solo Insurance on West Florissant close to where looting and vandalism briefly broke out in early August after a police officer shot to death teenager Michael Brown. "I bring an extra gun now only because it has a bigger magazine," McMullen says. He began carrying it after tensions increased in the area following the shooting. He says he would never use it to protect his business, but he would use it to save his life. "So maybe I get trapped here or something and have to have a John Wayne shootout," McMullen says before interrupting himself, smiling. "That's the silly part about it: Is that going to happen? Not a chance. But I guess, could it? I'm the only white person here." McMullen is particularly cautious now, as all of Ferguson and much of the nation waits to see whether a grand jury will indict Officer Darren Wilson for the shooting. 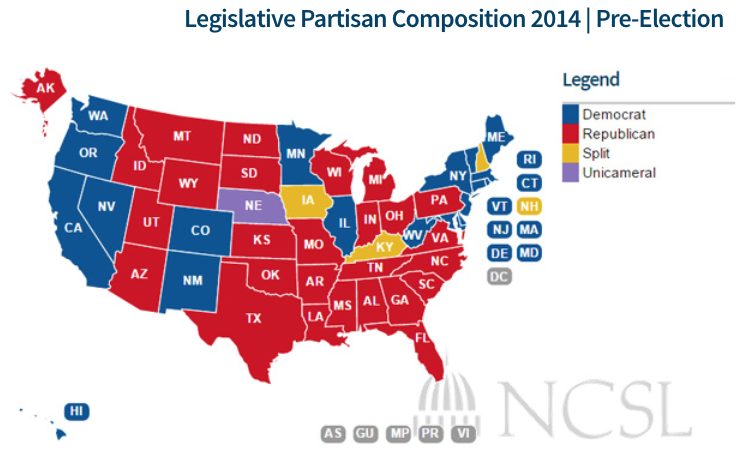 Though the grand jury has until January to issue its ruling, the prosecutor's office has said a decision could come in mid-November. . . .
With Obama as president Republicans have more than doubled the number of state legislatures that they control. 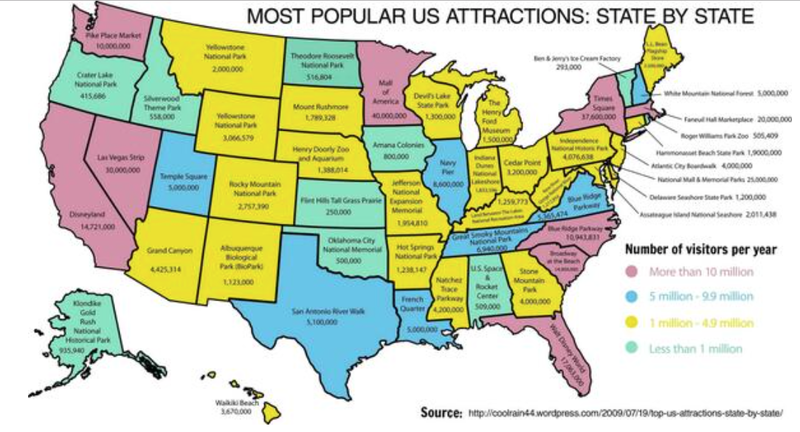 Interestingly, the 2012 election didn't slow this trend. 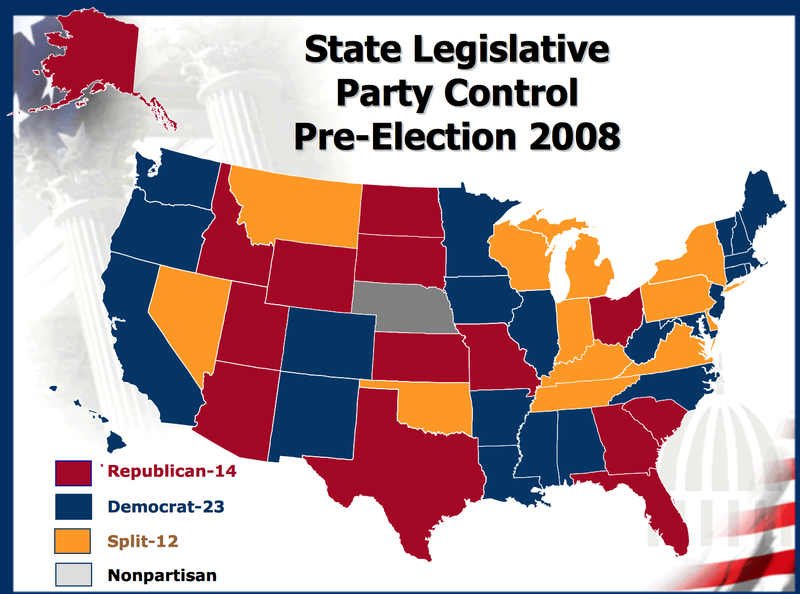 Obama's election in 2008 had impact on the number of legislatures controlled by Republicans, but Democrats did pick up four legislatures. 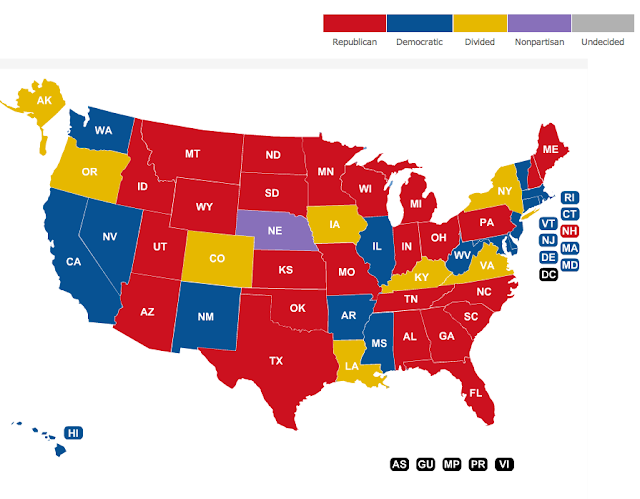 Republicans in control of 21 legislatures (22 with Nebraska). 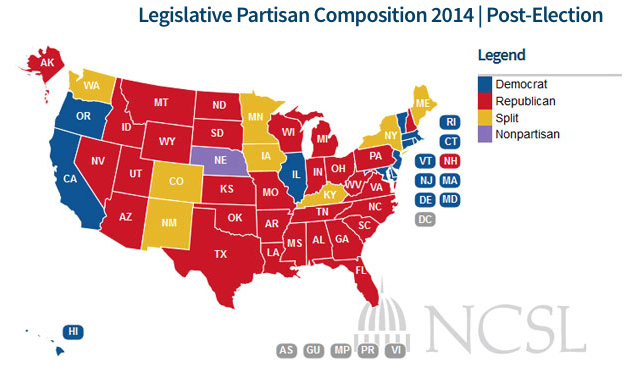 To put it differently, while Democrats controlled 23 legislatures prior to 2008, they now control 11. 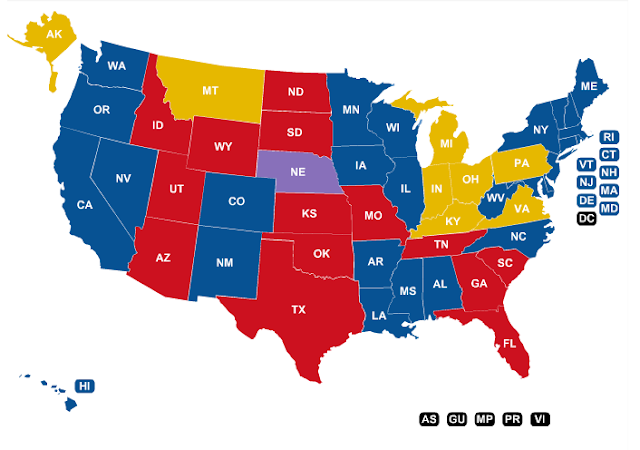 Over that same time Republicans went from 14 to 30.